Using diorama scenery to enhance your miniature's base can take even a drab figure to a totally new level. Inside, I'll go over the most basic steps to giving your mini that extra oomph with scenic basing. One of the coolest things about painting and playing with miniatures is the ability to create scenic, diorama-esque bases for them. While a plain base will serve you well on the battlefield, a custom scenic base can make a mini go from good to great in no time at all. You’re going to need a few things past the usual brush and paint set to maximize your ability to base miniatures. Ultimately, this can be as pricey or inexpensive as you like. On the cheap side, you could acquire everything you need from the first three bullets for less than $20 USD (plus maybe picking up pebbles and small twigs from your yard), and it would give you enough material to base out dozens of miniatures. But high quality accessories can often be expensive, so if you want nicer or more detailed bases, it will cost you. Still, creativity is king! You can make excellent bases on the cheap if you plan it out well. First things first: you’ll need to decide where your army will be fighting. Maybe your troopers are reliving the Battle for Endor amidst overgrown brush and mud, under the watchful eye of the second Death Star. Perhaps they’re attempting to crush the New Republic in the arid deserts of Jakku. Or maybe they’re somewhere entirely of your own making, fighting a battle only you know about. Thanks to the massive Star Wars galaxy that already exists, you have dozens of feasible locales around which to plan your bases. 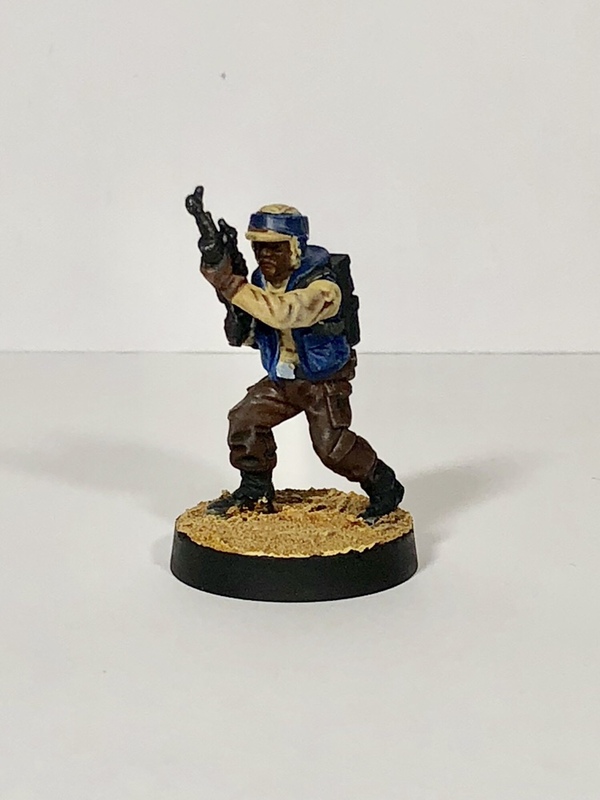 For the Rebels, I used Vallejo’s Desert Sand texture, and for the Imperials I used Vallejo’s Brown Earth. Peruse the links to Citadel and Vallejo products in the bulleted first section to see what products work best for you. Most Vallejo products come in 200 ml jars and cost between $15-$20 USD, allowing you to base a massive number of minis. Citadel products will run cheaper at around $8 USD, but will base fewer minis. Scoop a small amount of your chosen product out of the jar or bottle, and apply carefully and thinly with an applicator tool, toothpick, or tongue depressor to your miniature’s base. Work slowly around the miniature itself. Mistakes happen, of course, so keep a paper towel handy to wipe any excess product off as quickly as possible. Think, too, about the environment you’ve chosen: will it be flat, uniform, like Jakku? Or might it be hilly and muddy like Endor? This could change the manner in which you apply your texture. After you’ve applied the texture, let it sit for a couple of hours to ensure that it is totally dry before you move onto the next step. If you’re using a Vallejo product, make sure that it’s totally hardened. For Citadel, you might gently dab it with your finger to ensure no residual moisture is left. Now that everything is dry, we’re going to add character to the texture using washes and drybrush highlights, just like we would with out minis. I used Citadel’s Seraphim Sepia, a robust orange-yellow wash, to bring out color and depth to my sand texture. With my Dantooine Imperials, I decided that I wanted to wash the Brown Earth texture with Citadel’s Athonian Camoshade, a nice deep green color. I found that Agrax Earthshade made things too dark, but Camoshade gave it almost a swampy feel that contrasted well with the bright, warm colors from my Imperial units. You can apply your wash as gently or generously as you wish: I went lightly on most of mine, but you could easily create deep mud pockets by filling the crevices and indentations with plenty of wash.
Once the wash has had enough time to dry out completely, select an appropriate color to highlight the texture with. For the beach bases, I did a quick brush with a 1:1 mixture of beige and white, just helping to bring out a few of the peaks. 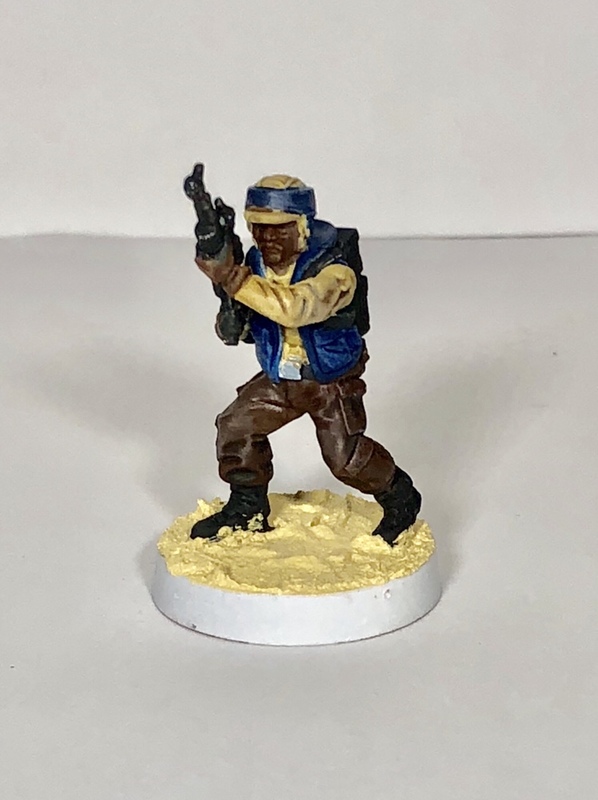 For the muddy Dantooine bases, I used a straight beige. 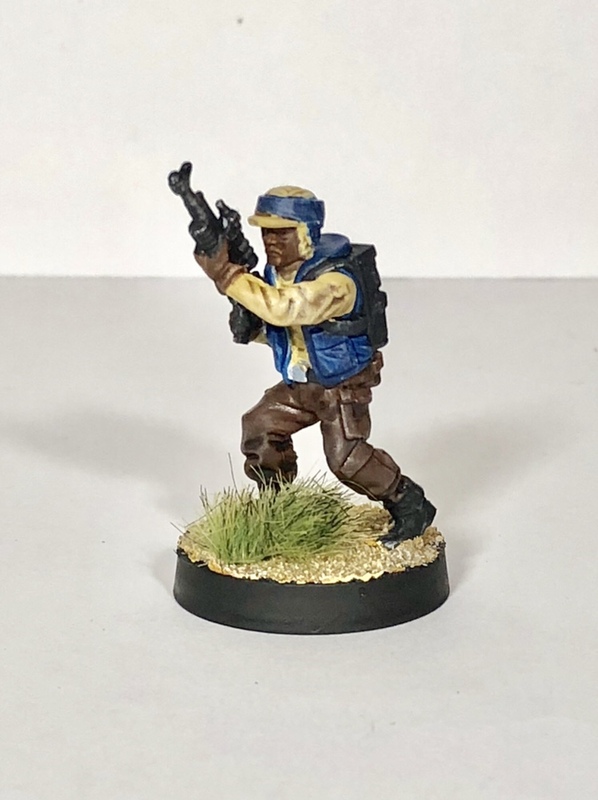 Now is a great time to paint the edge of your bases, as well. Perhaps, as I detailed in a previous post, you’ll simply paint your units a uniform black around the edges. Or perhaps you, like me, have decided to make all of your unit leaders a specific color so they stand out more readily on the battlefield. The choice is yours! If you’ve so decided, you can stop here with complete satisfaction. Planets like Hoth, Tatooine, and Jakku, with minimally detailed environments, are perfect for beginner bases. However, if you’ve decided that you want to add a few final flourishes to your base, continue to step four. Once the foundation is settled and painted, you can go above and beyond by adding 3D environmental elements to really make your bases pop. I personally prefer using The Army Painter’s Battlefields and Battlefields XP lines, but there are a huge number of possible products that will give you good results. Some things, like sand and dirt, are easy to replicate. Others, like varied grass flocking, are better when you use higher quality items. Feel free to mix, match, and try a variety of products out. For the beach bases, I’m going to first cover the majority of my sand texture with actual craft sand. To do this, you can simply water down some PVA glue into a well on your palette like you would with any acrylic paint, then use an old or unwanted brush to gently dab the watered down glue onto your completed base texture. Then, while it’s still wet, sprinkle your flocking or sand over the glue generously, and give it 45-60 minutes to dry. Afterwards, shake your miniature so that the excess flocking falls off, and you’ve got a beautiful grassy/sandy/whatever miniature. I’ll then be adding a few of these beautiful swamp tufts (poorly named, in my opinion, because they look great as shrubbery you’d see on a beach) to some but not all of my Rebels. With just a dab of super glue on the underside, I can place them haphazardly on the base to give it a natural feel. For the muddy Dantooine bases, I can use those same swamp tufts on top of some static field grass, for which I used the same PVA glue trick as before. In cases like my beach base, the texture is, more than anything, to give a 3D quality to the environment. For the muddy field bases, though, I’m choosing to leave some of it exposed and more actively using the texture as part of the scene. Don’t forget that variety is your friend. If all of your bases look exactly the same, they’ll be less interesting. On some of my Imperials, I covered the entire base in grass. On others, I used almost none. The more varied your bases, the more cohesive the army. Be creative, and don’t be afraid to get messy! Maybe, outside of flocking and tufts, you decide to use some cork to create a rocky landscape. Maybe you paint your base a glossy black and create a mouse droid to-scale from scratch. With just a little bit of work, your miniatures can go from drab to fab. Best of luck, Commanders! For heavy and support vehicles, find a way to keep the firing arcs in the design. I did this by using my applicator tool to carve out the lines while my Brown Earth texture was still drying, as seen below.. There are acrylic tokens you can buy that fit within your front movement peg to determine arc, but it’s probably better to play it safe for now. Don’t add height or breadth to your miniatures. Since line of sight is currently an important part of the actual gameplay, keep your mini’s feet glued to the actual plastic base. And don’t let your scenic elements overlap the edge of your base, either, lest they interfere with other minis. Keep it simple, keep it at the same height. Base around your miniatures. I used my applicator tool to carve out the firing arcs while the texture was still drying.